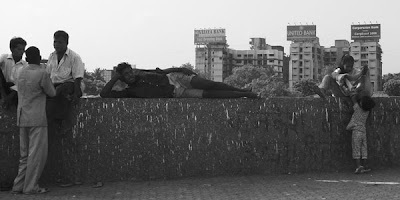 The last time I was in Bombay/Mumbai I was nine years old. We were on a ship from Australia to Italy and it was January 1966. That time we moored at one of the docks in the great bay and were taken on a tour of the old part of the city. The sun was setting as the ship's crew threw down the gangway, so by the time we disembarked it was night. I still remember the warm, dark air, the bright colors subdued by shadows, the riot of people, children (I was a child too remember) running in the streets and squatting in what looked like cages but I suppose now must have been in the space between open windows and their protective iron railings. And the delightfully different coins - squared with rounded corners and holes, others with edges so indented they looked like pressed flowers. Forty-two years later I’m back. This time its by air, having just flown in from Hyderabad. 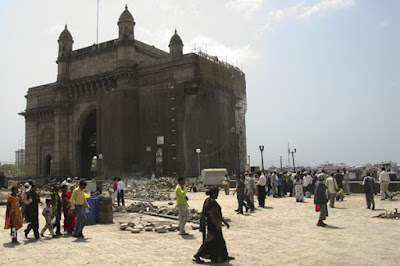 I have a few hours between flights so I dump my bag at the left luggage and grab a taxi to go straight to the Gateway of India, the triumphal arch the British built to celebrate their conquest of the subcontinent, and the last thing I remember of Bombay from the first time here. The trip in from the airport showed me much of what has changed in all these years, and much of what has not. The city is so much bigger of course, and its local official name is Mumbai, no longer Bombay. The traffic still tilts in its crazy course but nothing like that of Hyderabad. The roads are large and mostly well maintained. The city has been around a while and development is more structured, I suppose. There is still the grinding poverty, brutally evidenced by the families living on the sidewalks, children running naked, men showering themselves from buckets next to trash heaps and women cooking meals between bricks. Several times people came up to the taxi window to ask for money – which I gave them in exchange for a foto. 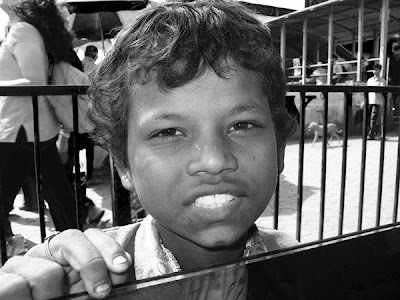 From that point of view the city doesn’t seem that different from the images in “Salaam Bombay”. The square and monument are both under refurbishment. No longer can cars go around the Gateway as I remembered. The boats still pull up at the wharf. Tourists from all over the world come to stand at the parapet and look at the Bay and ocean beyond. Vendors still hawk their wares – this time the proposition is for water inflatable balls of jell, soft colored marbles glistening in glass beakers. “Twenty rupees? 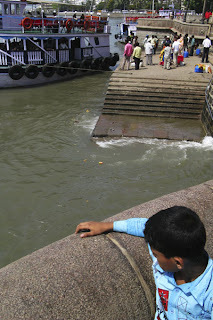 No way!” Having done my quick tour I went to visit one of Ganesh’s friends, Krsna Mehta. Krsna (pronounced Krisna) designs and manufactures beautiful soft furnishings that are sold around the world. His studio is a double loft in an old warehouse complex; great beams of warm teak standing between heaps of multi-hued cushions and fabrics. Good environment and I’m sure one reason many graduates from fashion schools look to work at Zeba as their first professional job. Krsna very kindly gave me an autographed copy of his book on Mumbai – a spirited and imaginative collection of photographs and digital collages similar to those I’ve seen in the US and UK. In fact I’m sure I’ve seen a few by Krsna there too. Too soon it was time to fly from India, first to Bahrain and after a long stay there, on to London, where I waited yet again for the connecting flight to Nice – and home.